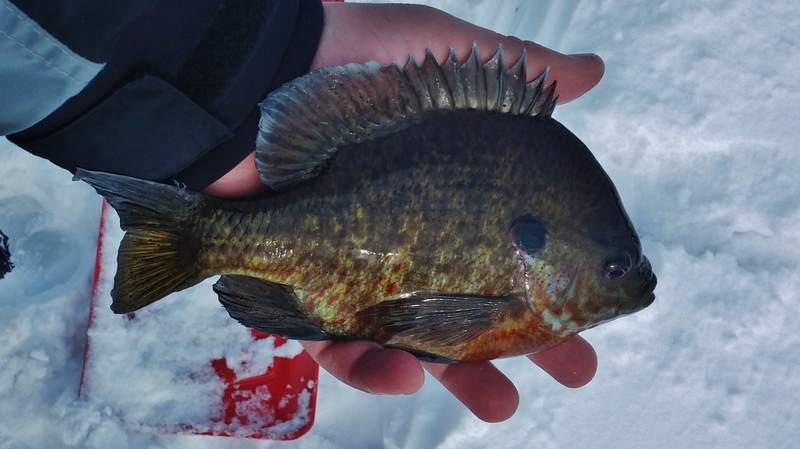 Catching gills is always fun but it can also be very frustrating. When my buddy Tom called me up and said he needed some fish for a work related fish fry, I had just the spot in mind. While I hadn’t checked on the pond yet this winter, the timing was exactly one year from when I had found them last winter. I figured that they would be either in the weedbeds or closely adjacent. After walking out to a weedbed that I had outlined in the summer, I cut out a large area hoping to find the fish on the edges suspending over short weeds. After only a few holes, I turned to see Tom with a beauty already in hand. Things were looking up and after I finished shredding a small area, I returned to find Tom with a nice pile of fish already started! The bite stayed strong until around 10:30 when the sun poked through the fog. While bluegill were the main target, we also caught quite a few bass that were aggressively feeding in the mix. 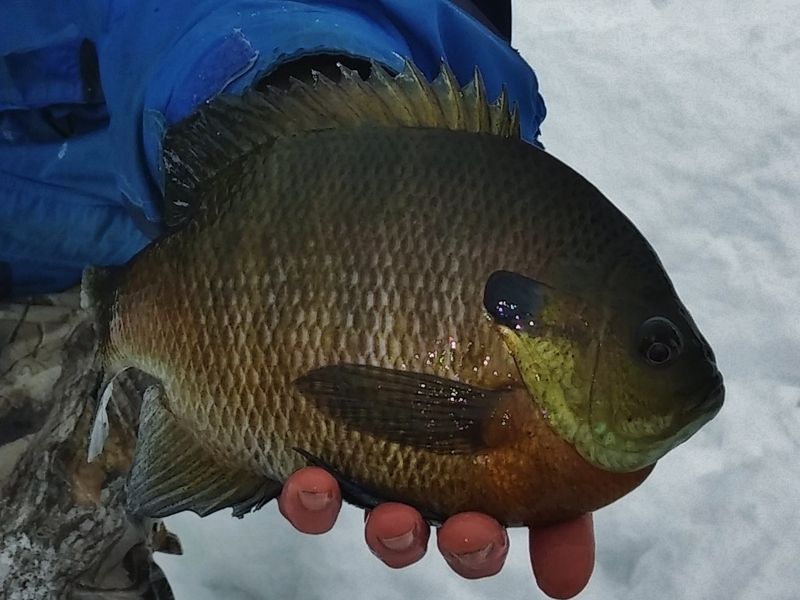 Throughout the course of the 5 hours that we fished, we released quite a few nice gills that broke the 9″ mark. Things couldn’t have gone better. We had enough fish for his needs around noon so we packed it up and headed for a warm lunch at the nearby diner. Previous Post2-1-15 – Quiet Day On The IceNext Post2-8-15 – Lots Of Holes!